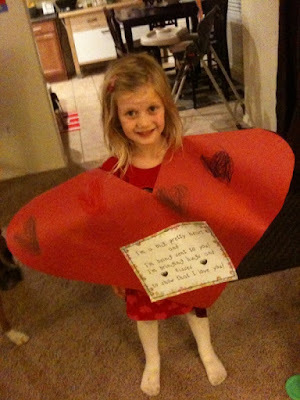 Shelby wearing the Valentine's Day heart she made at school. It has a poem on the front. 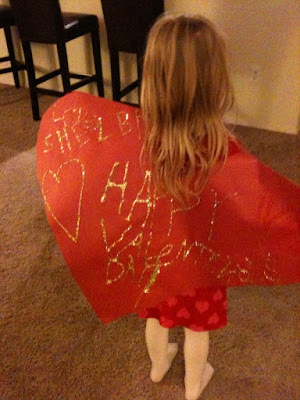 And on the back it say Happy Valentine's Day, Love Shelby ... in GLITTER! Shelby has loved Valentine's Day this year. She was super excited to make cards for her friends (she addressed and signed them all herself) and she attached treats to all her cards as well. We made a special book for her teacher, Miss Burns. It featured a pictured of her and then I had asked her why she loved Miss Burns. I typed up the five responses she gave me (She's kind. She helps me learn. She feeds us each day ...etc). I made the little book and then Shelby helped me embellish it She even drew a cute picture for the cover). It turned out quite girly and very adorable. Sadly, I forgot to take a picture of it before we gave to to Miss Burns. On Valentine's Day, Shelby got a little present from us to go with the Valentine's Day outfit she already received and wore to school for her party. Mike gave me a present that included a musical greeting card. I told him to show it to Shelby, because I thought she'd like it. When he did, she asked "Is this for me." Of course I let her have it. So for the entire day, she ran around the house, opening and shutting the card. By the evening she had memorized the song. Here is a little video of her with the card.